The March 9 Democratic debate held in Miami pitted Bernie Sanders vs. Hillary Clinton on the stage. The previous debate in Flint, Mich., held on March 6 saw the two candidates angrily talking over one another and clashing on everything from Bernie Sanders' tax plan for Wall Street to Hillary Clinton's education reform initiatives. The latest Democratic debate of 2016 covered key issues, from Hillary Clinton's stance on immigration to Bernie Sanders'. Maria Elena Salinas and Jorge Ramos of Univision and Karen Tumulty of The Washington Post served as moderators of the debate. Find out what the two candidates had to say about taxes, education and more. In her opening remarks, Clinton noted that removing economic barriers to success is one of her top priorities. "My focus is on more good paying jobs with rising incomes for families and how we prevent corporations from taking jobs out of our country by imposing an exit tax, making them pay back any tax breaks they've gotten," she said. Sanders did not go into detail about his proposed progressive estate tax rate structure or his 10 percent billionaire's surtax, but he did find a way to insert it into a discussion about education reform: "We are going to get to Donald Trump by raising the taxes on the top 1 percent and our millionaires and billionaires." Another hot topic of the evening was Bernie Sanders' education reform and Hillary Clinton's education policy. The two detailed their plans to make higher education more affordable. "We're going to refinance everyone's existing student debt, 40 million Americans have student debt," Clinton said. "... Under my plan, you will be able to also lower your debt, move into a program to pay it back as a percentage of your income and more than that, my plan for debt-free tuition at public colleges and universities will eventually eliminate any student debt. But for people who have it, I'm going to put a date certain that after a certain number of years, you no longer have to pay anything." "I do not propose free college tuition, I proposed free tuition at public colleges and universities" Sanders said. "... So I do believe we should make public colleges and universities tuition free, and I don't believe we should punish millions of young and not-so-young people with outrageous levels of student debt." Not surprisingly, Hillary Clinton went head to head with Bernie Sanders on health care; the two have markedly different approaches to ensuring Americans have proper coverage. Hillary Clinton criticized Bernie Sanders' plans for a single-payer health care program, claiming it would be more expensive than the senator is willing to admit. He responded with: "What Secretary Clinton is saying is that the United States should continue to be the only major country on Earth that doesn't guarantee health care to all of our people. I think if the rest of the world can do it, we can." In response to Sanders' accusation, Clinton said she has been a champion for universal coverage but is more realistic. "Between the Republicans trying to repeal the first chance we've ever had to get to universal health care, and Senator Sanders wanting to throw us into a contentious debate over single payer, I think the smart approach is build on and protect the Affordable Care Act. Make it work. Reduce the cost." Salinas noted that the net worth of Latinos has gone down 42 percent during Obama's presidency and 60 percent of Latinos earn less than $15 per hour. She asked the candidates what they would do to improve the living conditions of Latinos. On this, Clinton said, "We do need to raise the minimum wage and we have to guarantee equal pay for women." Sanders said: "We have got to raise the minimum wage to $15 an hour." Bernie Sanders' policies on the environment are similar to Hillary Clinton's in they both believe climate change is man-made and requires immediate action. Tumulty started the dialogue by asking the candidates to share their concern on the effects of rising sea levels and climate change -- a question that was raised by more than two dozen Florida mayors. The two seemed to agree their plans would require major funding. Clinton said: "... We do have to invest in resilience and mitigation while we are trying to cut emissions and make up for the fact that this is clearly man-made and man-aggravated." "Now, I hope that Secretary Clinton would join me if we are serious about climate change, about imposing a tax on carbon on the fossil fuel industry and making massive investments in energy efficiency and sustainable energy," Sanders said. 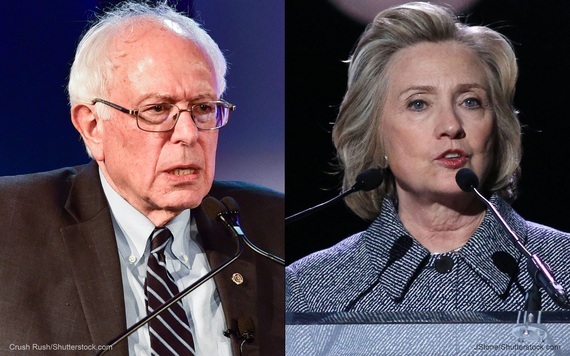 Which presidential candidate do you side with? Watch the next round of Democratic debates in April in Pennsylvania, followed by the final Democratic debate of 2016 in California in May. This article, 10 Money Quotes From the Miami Democratic Debate From Hillary Clinton and Bernie Sanders, originally appeared on GOBankingRates.com.